For heavy Facebook users, getting “likes” on posts, photos and check-ins can feel almost as good as getting real-world affection from the people you care about. The Like-A-Hug vest strives to strengthen the connection between the digital and physical lives by translating Facebook “likes” into real-world hugs. 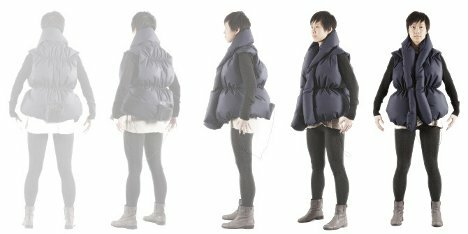 The hugs come from an inflatable vest which squeezes the wearer whenever a new “like” is registered on his or her Facebook page. The project was a collaboration between artist Melissa Kit Chow, Andy Payne and Phil Seaton. The idea came about after a conversation about the limitations of modern communication methods in long-distance relationships. Although we can easily communicate with people we cannot physically be with, the comforting physical interaction is missing. The Like-A-Hug vest makes that physical interaction possible again by passing along virtual appreciation in the form of a hug, and then allowing the hug recipient to return the interaction instantly. See more in Digital Design or under Technology. October, 2012.